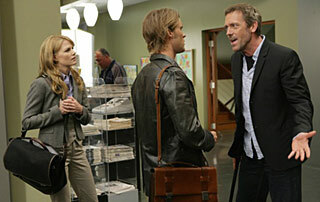 House MD Episodes: Season 4 #403 "97 Seconds"
Fourth Season Episodes :: #403 "97 Seconds"
House (Hugh Laurie) confronts Dr. Chase (Jesse Spencer) and Dr. Cameron (Jennifer Morrison) in the HOUSE episode "97 Seconds" airing Tuesday, Oct. 9 (9-10 PM ET/PT) on FOX. Foreman is working at another hospital and gets fired for breaking the same kinds of rules that House breaks all the time. House gets verbally abusive to Chase who calmly offers to help but refuses to listen to House rant - tells him if that's what he wants to do to "leave a message"
After watching Chase stand up to House, Cameron says she likes "him better this way." 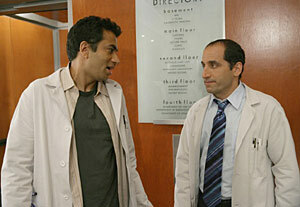 Taub (Peter Jacobson) and Kutner (Kal Penn) work together on a case when the candidates are split into teams by gender in the HOUSE episode "97 Seconds" airing Tuesday, Oct. 9 (9:00-10:00 PM ET/PT) on FOX. Guest Cast: Brian Klugman as Stark; Anne Dudek as Amber; Olivia Wilde as Thirteen; Peter Jacobson as Taub; Kal Penn as Baidwan; Carmen Argenziano as Henry; Edi Gathegi as Cole; Andy Comeau as Brennan; Meera Simhan as Jody; Melinda Dahl as Twin; Caitlin Dahl as Twin; Charlie Hofheimer as Almore; Kathleen York as Dr. Schaffer; mary Kate Schellhardt as Female Fellow; Reynaldo Rosales as Handsome Fellow; Douglas Spain as Latino Fellow; Bobbin Bergstrom as Nurse. "When a man in a wheelchair who fainted while crossing a street arrives at the hospital, House tells the 10 remaining candidates to divide themselves into teams. The one that diagnoses the man properly won't be fired. They split up based on gender, but one woman (Anne Dudek) opts to join the men. 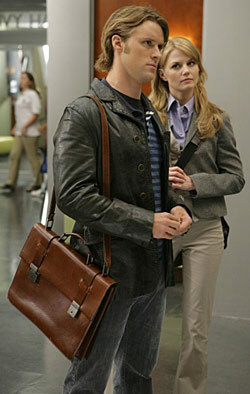 Meanwhile, a patient sticks a knife into a wall socket for reasons that intrigue House"
Dr. Chase (Jesse Spencer) and Dr. Cameron (Jennifer Morrison) are confronted by House in the HOUSE episode "97 Seconds" airing Tuesday, Oct. 9 (9:00-10:00 PM ET/PT) on FOX. House (Hugh Laurie) prepares to do an autopsy on a deceased patient in the HOUSE episode "97 Seconds" airing Tuesday, Oct. 9 (9:00-10:00 PM ET/PT) on FOX.